Sudden windfalls create a unique set of financial and emotional challenges. Without proper planning and coordination, mistakes can be costly. 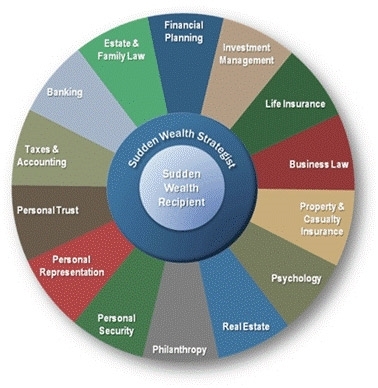 The Wealth Wheel illustrates the complex wealth management process. Of course, each person's financial situation is unique. While some sudden wealth recipients may require more planning services and advisors than listed on the wheel, not everyone will have the need for an advisor from each of these disciplines. As your sudden wealth strategist, Quartz accepts the key responsibility of creating and executing your financial plan, investment management and life insurance strategies, and coordinating the efforts of the rest of your financial team including the disciplines listed on the wheel.